40 mph, for 20 continuous ground miles, non-stop, through Los Angeles?! 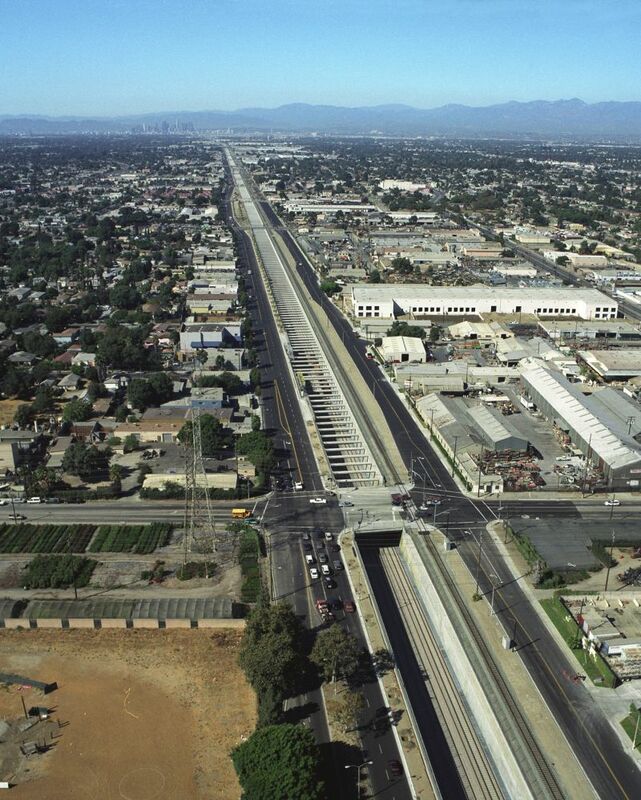 An example of increasing U.S. commitment to rail transport is highlighted by the 2002 completion of the Alameda Corridor Railway Trench in Los Angeles. 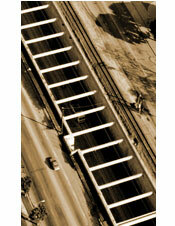 Above: Birds-eye view of Alameda Corridor Railway Trench. 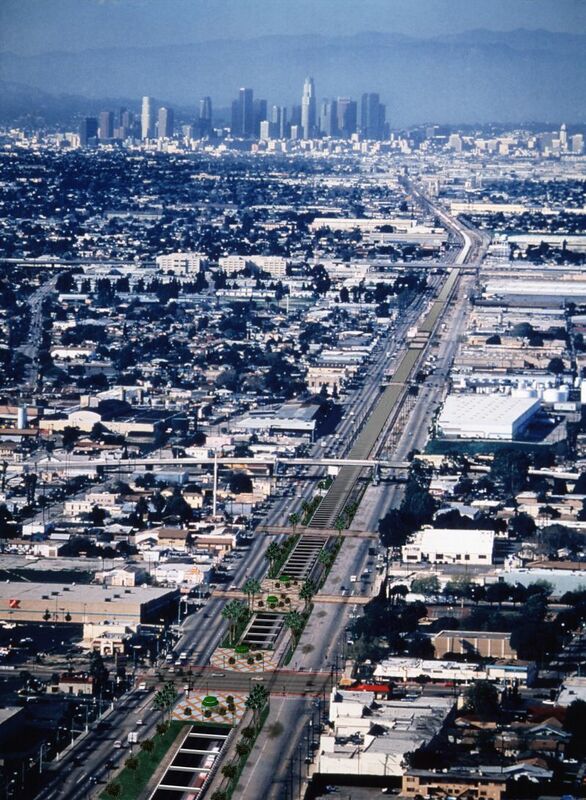 This image shows the trench with downtown Los Angeles and San Gabriel mountains to the North. The Alameda Corridor East Project is similar in scope and currently under construction. This corridor, which begins near downtown Los Angeles and heads East, will essentially connect to its North-South cousin. It will grade-separate 20 rail crossings and make other improvements allowing better flow of San Gabriel Valley auto traffic. A map of this corridor is here. These corridors are used by BNSF and Union Pacific. They allow cargo to be transported from the sea ports of Long Beach and Los Angeles to places like Fort Worth, Texas (the end of the BNSF line). BNSF's transport service has been a tremendous success. So much so that BNSF Railway has completed construction of a third main rail line through the Cajon Pass in Southern California. This will increase capacity on BNSF's Chicago to Los Angeles Transcontinental (Transcon) route from 100 to 150 trains a day. 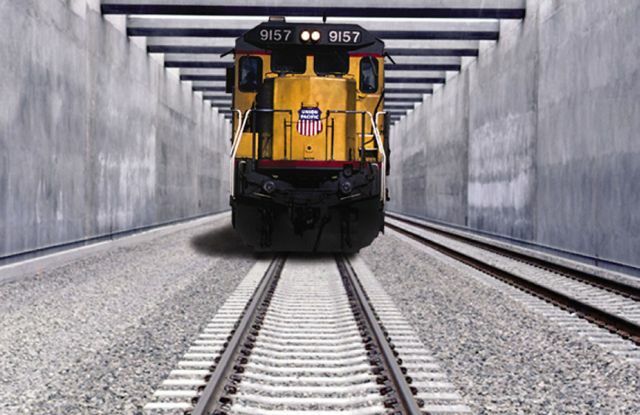 The $90 million project adds almost 16 miles of third main track to BNSF's route into the Los Angeles Basin.